ذاکری‌‌نژاد, زهره, روشندل کاهو, امین, نجاتی کلاته, علی. (1391). نقشه شباهت و کاربرد آن در تعیین نقاط با پتانسیل زیاد هیدروکربوری. 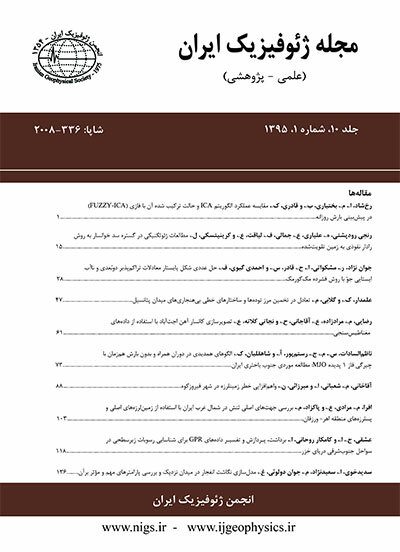 مجله ژئوفیزیک ایران, 6(2), 112-123. زهره ذاکری‌‌نژاد; امین روشندل کاهو; علی نجاتی کلاته. "نقشه شباهت و کاربرد آن در تعیین نقاط با پتانسیل زیاد هیدروکربوری". مجله ژئوفیزیک ایران, 6, 2, 1391, 112-123. ذاکری‌‌نژاد, زهره, روشندل کاهو, امین, نجاتی کلاته, علی. (1391). 'نقشه شباهت و کاربرد آن در تعیین نقاط با پتانسیل زیاد هیدروکربوری', مجله ژئوفیزیک ایران, 6(2), pp. 112-123. ذاکری‌‌نژاد, زهره, روشندل کاهو, امین, نجاتی کلاته, علی. نقشه شباهت و کاربرد آن در تعیین نقاط با پتانسیل زیاد هیدروکربوری. مجله ژئوفیزیک ایران, 1391; 6(2): 112-123. تعیین تخلخل همواره در برآورد ذخیره درجای هیدروکربن، بررسی تغییرات رخساره، برنامه‌ریزی بهینه به‌منظور توسعه میدان، کاهش مخاطره و همچنین حفر تعداد کمتری چاه و در نتیجه کاهش هزینه‌های حفاری بسیار حائز اهمیت است. نشانگرهای لرزه‌‌ای و نگارهای چاه داده‌‌هایی هستند که در اغلب تحقیقات مخزن موجودند.تبدیل چندنشانگری عموماً از تلفیق کردن نشانگرهای لرزه‌‌ای با نگارهای چاه برای آنالیز خواص مخزن اجرا می‌شود. یک مفسر برای تعیین نقاط بهینه حفاری نیاز به نظارت بر نقشه‌های گوناگون دارد که هرکدام دارای اطلاعاتی هستند. این فرایند طولانی و طاقت‌‌فرسا است و احتمال خطا در آن زیاد است.در این تحقیق روشی ارائه می‌شود تا از راه خلاصه‌‌کردن همه اطلاعات، تنها در یک نقشه، وظیفه مفسر را برای آنالیز چندین نشانگر لرزه‌ای، به‌صورت هم‌زمان آسان کند. این نقشه که نقشه شباهت نام دارد، همانندی پاسخ‌های لرزه‌ای هر منطقه در کل ناحیه مورد بررسی را نسبت به یک محل انتخاب شده (مبنا) در منطقه نشان می‌دهد. بررسی نتیجه نقشه شباهت و نقشه توزیع تخلخل در محدوده مخزن، همخوانی مناسب میان این دو نقشه را که از روش‌های متفاوت به‌دست آمده‌اند و هرکدام دارای اطلاعات مخصوصی برای مفسر هستند، نشان می‌دهد که به تصمیم‌گیری مطمئن‌تر برای انتخاب نقطه‌ای با پتانسیل زیاد اکتشافی و با مخاطره کمتر حفاری کمک می‌کند. Determination of porosity distribution is important in hydrocarbon reserve estimation, facies variations, optimized planning for field development and decrease in drilling risks and costs. Porosity is one of the most important parameters, which is considered as a fundamental factor in reservoir engineering. By knowing this parameter, specialists are able to design and manage, effectively, the process of oil and gas field development. Seismic attributes and well logs are the data available in most of the reservoir studies. Seismic attribute analysis is generally done through correlating multi attributes to the reservoir characteristics. A good interpreter needs to observe several maps with certain information to prepare optimal drilling points. Such a process is long and exhausting with high probability of error. We present in this paper a method to ease the interpreter’s task of analyzing dozens of seismic attributes by integrating all the information into just one map, this map, the similarity map, shows the resemblance of the seismic response of each region of the whole study area with respect to a selected location in the field. In this paper, 3D seismic data in the study area are interpreted using well data. In addition, seismic inversion was conducted in order to estimate the porosity distribution based on the acoustic impedance within the study area. Moreover, an attempt was made to predict the effective porosity by designing a probabilistic neural network (PNN) and simultaneously using seismic attributes and effective porosity logs in the reservoir window. This was done by deriving a multi-attribute transformation between an optimum subset of seismic attributes and effective porosity logs. Seismic traces close to the well locations were used to generate seismic attributes. Effective porosity logs at the reservoir area were the target logs in this study. A set of seismic attributes were generated using HRS software and a forward stepwise regression process was used to determine an optimum subset of attributes to be utilized in the training of neural networks. Ultimately, we obtained a porosity map of the studied area. The inputs of the similarity analysis included a set of uncorrelated seismic attribute maps, the coordinates of the control point, and the radius around the control point that circles an area (the reference zone) of nearly constant attribute response. Four different attribute volumes generated were then used in the study: instantaneous amplitude, instantaneous phase, instantaneous frequency, and acoustic impedance. A horizon-slice at the reservoir was extracted from each of the attribute volumes. First, Well 08-08 (a high producing well) was chosen as a reference well. The selection of the reference well could be the highest production well, the lowest production well, a dry well, or any other classification depending on the objective of the analysis. The objective was to map the reservoir of the field based on the reference point 08-08 for possible high production areas. A radius value around the well was then chosen to calculate the mean and the standard deviation of the reference point within the radius from the extracted horizon slice for each of the attributes. The output of the first step was (N) different reference means and reference standard deviation for the same reference point; (N=4) is the number of attributes that were used in the study. The next step was to calculate a zero-one matrix from the extracted horizon-slice for each attribute based on a statistical criterion that would assign either zero or one to every node for a given horizon-slice. Finally, zero-one maps were integrated into one single map. The four attributes revealed different information and their zero-one maps showed different distributions that help the interpreters correlate each map to other types of information such as production or geologic information. The final map was obtained by integrating the zero-one maps. Studying the results obtained from the “similarity map” and “porosity map” in reservoir zone presented a convincing correlation between the two maps found through different methods each having specific information for the interpreters and helping them make more reliable decision to choose a prospective point, with less drilling risks. ساطعی، و. و مختاری، م.، 1388، انجام برگردان داده­های لرزه­ای بازتابی و تاثیر آن در تخمین تخلخل در سازند بورگان در یکی از میادین نفتی جنوب غرب ایران، فصلنامه زمین، 4(4)، 39-46. عدالت، ع. و سیاه‌‌کوهی، ح. ر.، 1386، استفاده از رخساره­های لرزه­ای در توصیف یکی از مخازن نفتی ایران، مجله ژئوفیزیک ایران، 1(1)، 37-49. عدالت، ع.، سیاه‌کوهی، ح. ر. و توکلی مقدم، ر.، 1388، برآورد کردن تخلخل موثر مخزن با استفاده از تحلیل چند‌‌نشانگری، مجله ژئوفیزیک ایران، 3(1)، 1-18. Al-mogbel, A. M. S., 2002, Reservoir characterization using seismic reflectivity and attributes: M.Sc. thesis, Massachusetts Institute of Technology. Cornish, B. E., and King, G. A., 1988, Combined interactive analysis and stochastic inversion for high resolution reservoir modeling: Presented at the 50th EAEGMeeting, EAEG. Graebner, R., and Wason, H. M., 1981, Three dimensional methods in seismic exploration: science, 211,535-540. Hampson, D. P., Schuelke, J. S., and Quiirein, J.A., 2001, use of multiattributes transforms to predict log properties from seismic data: geophysics, 66, 220-236. Leipart, D. J., Hart, B. S., 2001, Comparison of linear regression and a probabilistic neural network to predict porosity from 3D seismic attributes in Lower Brushy Canyon channeled sandstones, southeast New Mexico, Geophysics, 66, 1349-1358. Michelena, R. J., Gonzalez, S. M., and Capello, M., 1998, Similarity analysis: anew tool to summarize seismic attributes information: The Leading Edge, 17, 545-548. VerWest, B., Masters, R., and Sena, A., 2000, Elastic impedance inversion: 70th SEG meeting, calgary, 1580-1582.